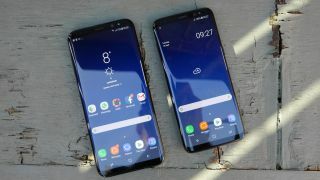 With all the positive reviews, including TechRadar's own, it might come as no surprise that Samsung would see a surge in customer interest for its latest phones, the Galaxy S8 and Galaxy S8 Plus. Turns out, that's exactly what's happened as Samsung has announced pre-orders for the S8 and S8 Plus have eclipsed those for the Galaxy S7 by more than 30%. The Galaxy S7 had held the company's pre-order record, but now that crown has been passed to the Galaxy S8 and Galaxy S8 Plus, "making it our best ever," Samsung said. The company did not break out exact pre-order numbers or say whether one of the S8's is performing better than the other. Samsung Galaxy S8 and S8 Plus pre-orders opened on March 30, one day after the new devices were officially unveiled. The phones went on sale in US stores on April 21, and will follow elsewhere, including the UK, on April 28. Though the new Galaxy phones have their own issues – including launching without Bixby Voice support and a red-tinted screen problem – Samsung appears to be on its way to rebounding after the disastrous Galaxy Note 7 launch. After Note 7s started catching fire, Samsung issued two recalls and eventually halted production and sales of the explosion-prone phone. After several public apologies and outlining a new battery safety review process, Samsung is turning to the S8 and S8 Plus to regain some of its luster as top Android phone maker. So far, the Galaxy S8 and S8 Plus launch have put Samsung back on that path, but time, as always, will tell.